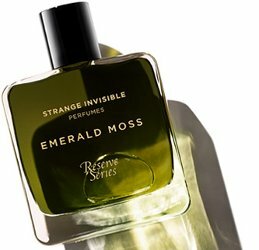 Indie natural brand Strange Invisible Perfumes has launched Emerald Moss, the first fragrance in their new Reserve Series. Notes include maté, ginger, temple mandarin, lavender, khus ruh (vetiver) and rose. Strange Invisible Perfumes Emerald Moss is $425 for 50 ml Eau de Parfum. This sounds very nice!! Wow! It sounds great! Can’t afford it! Something about the way the bottle looks in the photo and that gorgeous color of juice in it makes me want it. They did a great job on the photography. Sounds like a divine fragrance–and the price is certainly a match, LOL! I’m afraid unless this shows up on a decanter’s site, it will remain unsniffed by this humble person. Strange Invisible Perfumes is not on my radar since it’s just too expensive, as in past the Amouage-(price)point of no return. That price makes even this profligate acquirer pause. That’s hardly even worth splitting! Is it meant to be Emeraude-ish without the oakmoss? I would love to try it, though price is a barrier.